The pericarp—or outer layer—of purple and other brightly colored corn kernels also may provide an alternative source of colorants for food products, giving corn producers another value-added product from their crop, said the U. of I. team led by food science professor Elvira Gonzalez de Mejia and crop sciences professor John Juvik. They published their findings recently in the journal Food Chemistry. From a strain of maize called Apache Red, Juvik's team bred 20 genetic varieties of purple corn, each with a unique combination of anthocyanins, the nutritious, natural pigments that give the pericarp its vibrant color. Widely found in plant tissues, phenolic compounds tend to be aromatic and contribute to the color, flavor and acidity of fruits. Anthocyanins are one class of phenols, and studies have associated the consumption of anthocyanin-rich foods with reduced risks of cardiovascular disease, Type 2 diabetes and certain types of cancer. 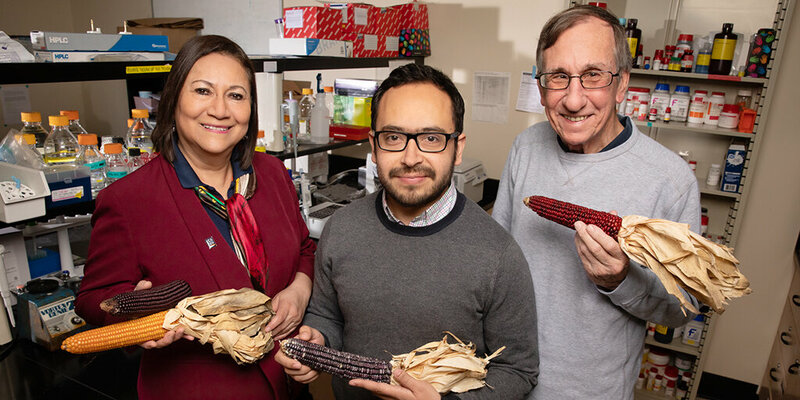 Using pressurized water, postdoctoral researcher and study co-author Diego Luna-Vital extracted the anthocyanins from the pericarp of the corn kernels, creating anthocyanin-rich water extracts that were then freeze-dried. While analyses of the extracts showed that the pericarp is an abundant source of anthocyanins and phenolic compounds, the concentration varied significantly among the varieties. To examine the impact of anthocyanins on obesity-induced inflammation, then-graduate student and first author of the study Qiaozhi Zhang combined fat cells—called adipocytes—from mice with large immune cells called macrophages. Bringing a Tent Peg to a Sword Fight In the first Battle of Armageddon, the enemy commander was killed with camping equipment.